ATV-5 Georges Lemaître, the European Space Agency's fifth and last Automated Transfer Vehicle cargo ship, arrives at the International Space Station on Aug. 12, 2014 to deliver more than 7 tons of supplies. Europe's ATV spacecraft are one of several unmanned cargo ships keeping the space station stocked with supplies. 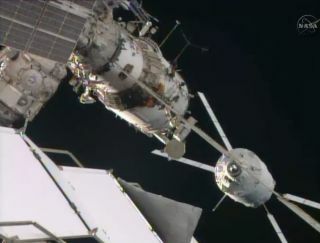 An unmanned European cargo vessel has linked up with the International Space Station for the last time. The European Space Agency's fifth Automated Transfer Vehicle (ATV-5) joined up with the station at 9:30 a.m. EDT (1330 GMT) on Tuesday (Aug. 12) as both spacecraft sailed high over southern Kazakhstan in Central Asia. The delivery is the final one by Europe's ATV fleet of spacecraft, which has been resupplying the orbiting lab since 2008. The huge ATV-5, which is named "Georges Lemaître" after the Belgian astronomer and priest credited with originating the Big Bang theory in 1927, blasted off from French Guiana atop an Ariane 5 rocket on July 29. The vehicle is packed with more than 7 tons of food, water, spare parts and scientific experiments, which the crew of the space station's current six-man Expedition 40 will begin offloading soon. The European Space Agency's ATV cargo vehicle delivers 8.3 tons of solid and liquid cargo to the International Space Station. See how the unmanned spacecraft work in this Space.com infographic. The scientific gear includes a European Space Agency (ESA) experiment called Haptics-1, which will install an advanced joystick on the station. Astronauts will use the joystick to play simple video games, helping researchers understand how microgravity affects motor control, ESA officials said. Georges Lemaître also carries some new rendezvous and docking sensors that could be used on future European spacecraft. The cargo ship tested this technology out during a close flyby of the space station on Friday (Aug. 8), when ATV-5 passed just 4.3 miles (7 kilometers) beneath the $100 billion orbiting complex. The resupply craft will stay docked with the station for about six months, ESA officials have said. Georges Lemaître will then be loaded up with trash and sent to burn up in Earth's atmosphere, as the four previous ATV vessels have done. Those other four ATV craft were known as "Jules Verne" (which launched in March 2008), "Johannes Kepler" (launched in February 2011), "Edoardo Amaldi" (blasted off in March 2012) and "Albert Einstein" (lifted off in June 2013). Unmanned cargo resupply will go on without the ATV vessels. Russia's Progress spacecraft and Japan's H-II vehicle are still flying, as are two unmanned ships built by American spaceflight firms. SpaceX's Dragon capsule has flown three of 12 missions to the orbiting lab under a $1.6 billion NASA deal, while Orbital Sciences' Cygnus craft has completed the first of eight runs it will make under a contract with the space agency worth $1.9 billion. All of these resupply vessels are disposable except Dragon. Rather than burn up in Earth's atmosphere, it makes a soft, parachute-aided ocean splashdown and can be used again.